on September 17, 2019. This event will feature over 35 of the best restaurants in the Valley as well as silent auctions, raffles, live entertainment, and much more. Pre-sale Tickets are now available for $40 each. Ticket cut-off is September 16, 2019 at 3pm. Tickets will be $50.00 at the door on the day of the event. Don't miss out on the biggest fundraiser of the year! 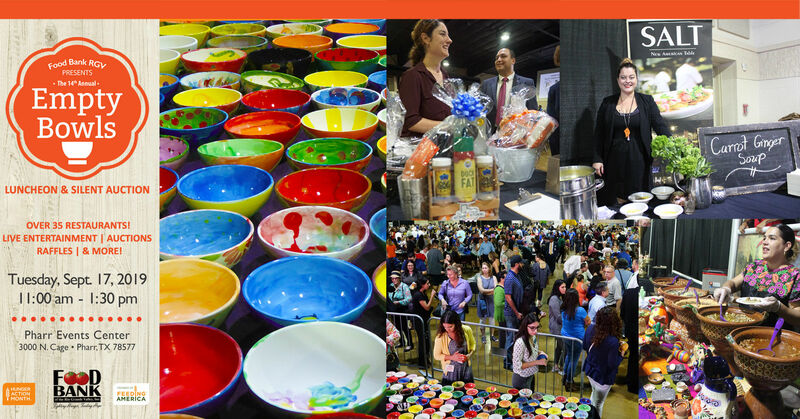 Your ticket includes admission into Empty Bowls 2019 at the Pharr Events Center on September 17, 2019. As a thank-you for attending you will be able to select a hand-painted ceramic bowl to take home as a reminder that there are still many bowls that need to be filled in our community. Your donation will help us provide 200 meals for people in need in the RGV. This sponsorship will provide 50,000 healthy meals! This sponsorship will provide 25,000 healthy meals! This sponsorship will provide 12,500 healthy meals! This sponsorship will provide 5,000 healthy meals! This sponsorship will provide 2,500 healthy meals! Food Bank RGV has partnered with Give Lively to securely process your online donation. This transaction will appear on your credit card statement as "Food Bank RGV". This transaction is subject to Give Lively's Terms and Privacy.